Razor sharp starting at f/2.8. Virtually no flare and very low CAs or fringing. Wonderful bokeh (especially during macro use). Smaller and lighter than most 1:1 macro lenses. *I didn’t test this lens’ durability but my friend Stephen did. Within minutes of opening the box he dropped it from a height of 1M onto concrete. The filter mount ring took the brunt of the impact (note silver filed away area in these shots) but the function of the lens was not otherwise affected. Wow! Slow focusing due to extremely long focal range. Lack of focus limit switch (might correct previous point). Focus ring spins during autofocus operation. Included lens cap falls off too easily. Extremely limited stand-off distance at 1:1 magnification (read: “none”). Diffraction may be a problem above f/8 with non-macro shots. The BlackRapid R-Strap RS-4 camera strap was only product I came across at PMA that I decided to buy and try for myself because I thought it was such a clever solution for an age-old problem. BlackRapid has obviously gotten a lot of press for this product because I am seeing a high percentage of Google hits on my site from my single mention of it last week. So, I decided to forgo the usual studio photography routine and go ahead and publish my user review to help all of those of you obviously trying to figure out if this thing is worth all the hype. Quick access to camera as advertised. New design camera mount is fairly easy to use and solid. Decent construction quality of shoulder pad. Camera incessantly gravitates to an in-the-way position. Camera dangles and spins at your side. S.W.A.T. team riot gear styling. Shoulder pad does not stay put. Connection clip may contact LCD screen potentially causing damage. Camera can not be set flat without removing mount. Sharp edges on camera mount can damage surfaces, other objects, etc. I’m guessing by this point you can tell that I’m not a huge fan of the R-Strap. The most disappointing thing is that I had such high hopes for this product. In fact, I made a special trip back to BlackRapid’s booth and forked over $40 (PMA show special- $8 off their MSRP) just so I could start using it right away even though they promised to mail me a review unit after the show. Eager to get rid of my 12 year old Nikon branded neoprene shoulder strap, I stepped around the corner and quickly tore into the package. Immediately, I encountered difficulty with the connector clip. Then, I struggled to get the length of the strap adjusted to suit my preference. After spending a good 6-8 minutes squatting behind a trash can I was finally ready to put the R-Strap to use. Within the first 5 minutes I was already starting to think I had made a mistake. My camera just wouldn’t stay put. It kept gravitating to the bottom of the strap which put it on my right hip with the lens sticking straight out into my arm and oncoming traffic. I tried turning and shifting my camera sideways and around to the small of my back like the BlackRapid people had shown me to do standing in their booth. But as soon as I started walking it would quickly slide back around front where I’d smack my lens against my arm or some poor soul walking by. I knocked the lens hood off my little kit lens 3 times in the first 10 minutes of use. 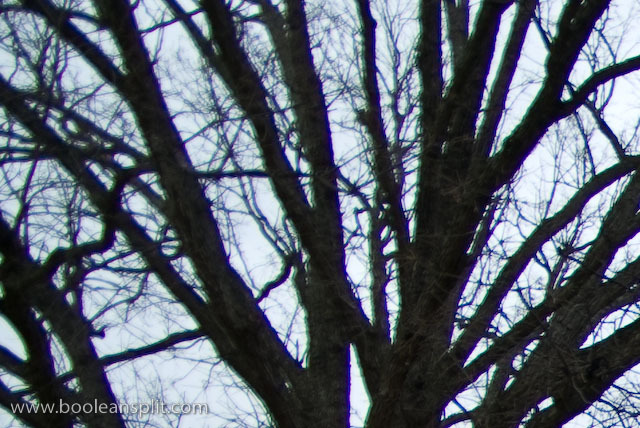 I can’t imagine how bad it would have been had I been sporting a longer lens. Thinking that maybe I hadn’t gotten used to this new-and-improved way of carrying my camera, I was determined to give it the ol’ college try and muddled through the rest of the day and half through the following day. Yes, the R-Strap did make it quite quick and efficient for me to get my camera to my eye and snap a picture. And, I love the fact that the strap doesn’t get all tangled up across the eyepiece like a traditional strap always seems to do. However, I just couldn’t get used to my camera dangling, twirling and knocking into everything while I was walking the show and the streets and casinos of Las Vegas. BlackRapid seems to market their product to people on the go. From my experience the R-Strap is really only suitable for photographers in a static position that need quick access to their camera (like sports photographers standing on a sideline with three cameras around their neck). I can see how it might work better attached to the tripod collar on a larger telephoto lens- though the laws of gravity seem to suggest that it’s always going to seek the lowest point and not stay behind your back as BlackRapid suggests. As it is- combined with the geeky styling, camera dings and high price tag- I can not recommend the R-Strap. And I’m really bummed about that. Be that as it may, lot’s of people seem to swear by it so make your own choice. Vastly improves ergonomics, balance and stability of the camera. Extra battery equals more shots between charges. Ability to designate grip battery as the primary battery so it depletes first- leaving the in-camera battery as a back-up. Redundant controls for vertical shooting. Solid OEM build quality (weather sealed, too). Does not require removal of in-camera battery and battery door like some grips do. Nifty storage slots for extra SD card and Pentax IR remote. Makes camera look more “significant”. Added bulk (may not fit in many bags). Redundant controls are not placed identically to camera controls and do not function as well. Tripod screw mount takes a few seconds to engage/disengage. Vertical grip not as substantial as regular grip. Having used the grip for three days of walking around the Las Vegas Convention Center and a couple of days worth of my normal routine I can safely say that this is the best accessory I have purchased for my camera. Surprisingly, it’s not because of the extra battery life. The main advantage of the battery grip for me is the dramatic improvement in the ergonomics and handling of the camera. If you own a Pentax DSLR you owe it to yourself to pick one of these up (the K200D uses the BG3 grip). The improvements it makes are easily worth the $130. I actually believe that this is one of the only accessories that I have tried that can actually help improve the quality of your photographs by making the camera a more natural extension of your hand. If you have another brand of camera I can only assume that their battery grips will provide a similar improvement in the handling of your camera (though some are a bit more fussy to work with). My friend Stephen loaned me his Pentax SMCP-DA* 16-50mm f/2.8 ED AL (IF) SDM lens so I could put it through its paces and compare it to my kit lens (SMCP-DA 18-55mm f/3.5-5.6 AL). 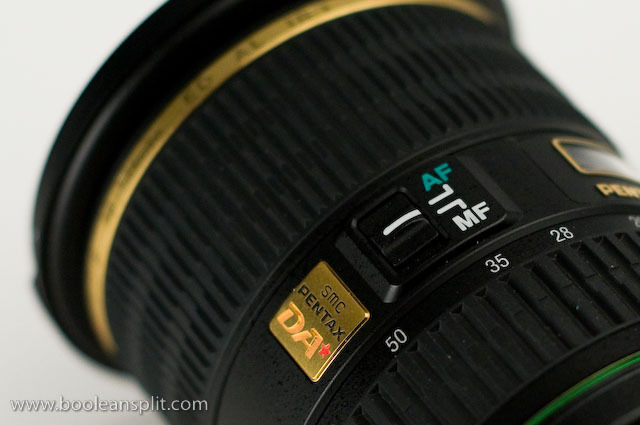 If you don’t know already, Pentax’s DA* (”D-A-star”) line of lenses are their highest quality zooms. They feature very high quality construction, weather sealing, silent ultrasonic focus motors (SDM), and Pentax’s best SMC coatings (SP) to date. Retailing at close to $700 this lens seems like it should be a huge step up from the $99 kit lens. This isn’t a technical review. If you want MTF and distortion charts go here. Instead, I’m just going to cover my observations during real world everyday use. Keep in mind that I do have a unique perspective here so take my opinions with an appropriate grain of salt. Here are my overall findings. Feel free to read on for a more in-depth look at how I formulated my opinions. While I would normally suggest upgrading the standard kit lenses from Canikon, Pentax has done an excellent job with their SMCP-DA 18-55mm f/3.5-5.6 AL and this gussied up DA* lens only helps to prove that point. Had I bought this lens myself I would have sent it back after the first day and put my money to better use. This is a big, heavy and expensive lens that does not prove a significant upgrade to the kit lens in everyday use. Get and/or keep the kit lens and put your money towards a dedicated ultra-wide angle lens and/or some fast primes to compliment the kit lens (some suggestions can be found at the end of this article). 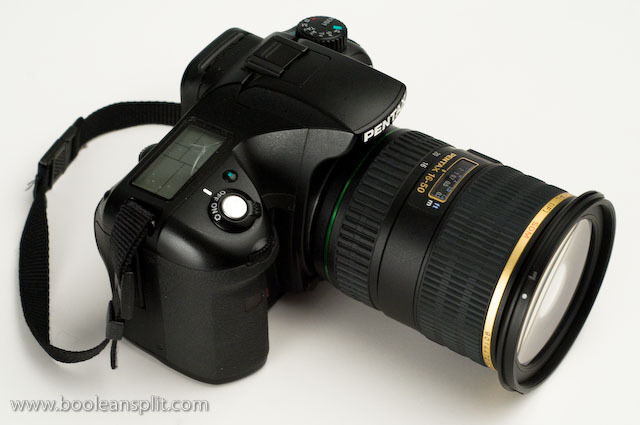 Purchasing a lens for me encompasses four primary areas of concern: image quality, build quality, handling, and value. There is no standard order of importance here as all of these issues carry different weight depending on the intended application of the lens in question. 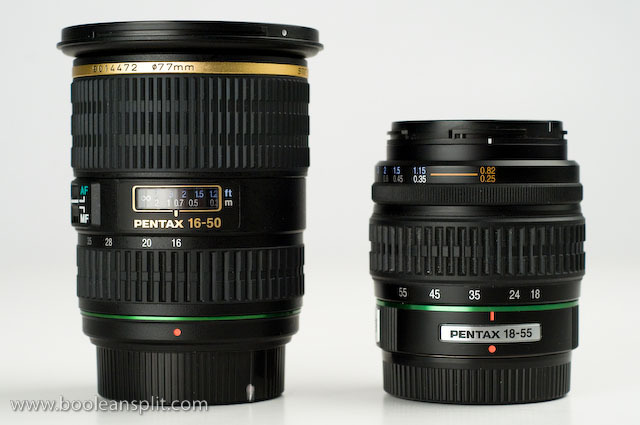 In this case, the 16-50 seems ideally positioned as an upgrade to the standard kit lens. This makes it an all purpose lens that should perform equally well in all four areas while handily outperforming the kit lens (which is why I am comparing the two here). I think the crop above says it all. Shoot this lens at 16mm with anything less than f/4 and the color fringing (chromatic aberrations or “CAs”) and edge softness are quite disappointing. F/8 is required to eliminate the problem altogether from wide shots. The fringing persists all the way up to 50mm but is generally less of a problem at the longer focal lengths due to the shorter depth of field at f/2.8 (CAs get lost in the bokeh). Center sharpness is pretty good wide open (f/2.8) at all focal lengths and becomes tack sharp at f/4 and above. Overall color and contrast are very good (as it is with all Pentax lenses). My biggest issue here is that the three main advantages this lens should have over the kit lens are sharpness, speed and the wider field of view (FoV). I found myself stopping down to at least f/4 for most of my shots with this lens, only using f/2.8 in extremely low light hand-held situations and when controlling the depth of field (DoF) was critical. The extra 2mm on the wide end (16mm vs. 18mm in the kit lens) are noticeable due to the greater FoV but more notably for the exaggerated barrel distortion. This isn’t a deal breaker for me but is disappointing at this price point. On the other hand, stopped all the way down to f/22 and opened up wide to 16mm, this lens produces some very nice results for landscape photography. Its nine bladed aperture creates awesome 18 pointed starbursts with very little flare. This is one of the areas where the higher build quality of the DA* really shines (pun intended). Not much to say here. 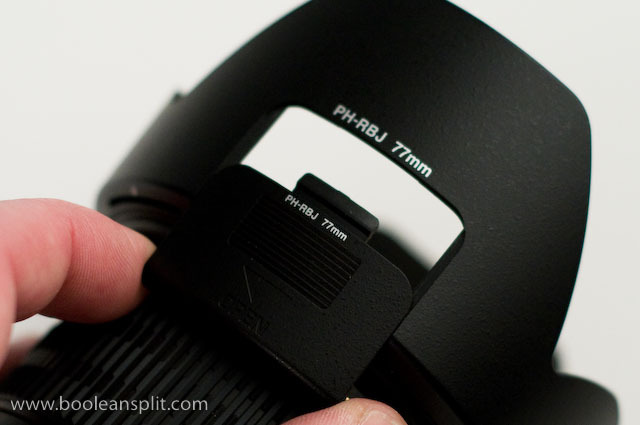 This lens is built as well or better than the best lenses from any mainstream manufacturer. One heft and you will not question its price tag. Typical to the DA* line, the 16-50 features gasketed seals to prevent dust and moisture penetration, including a seal at the lens mount to seal it to the camera body. 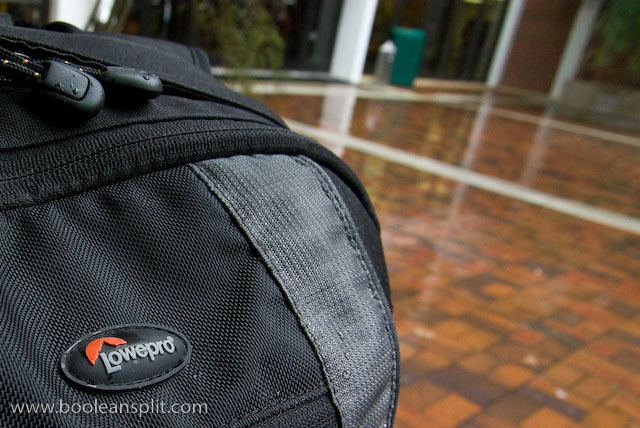 Combined with Pentax’s weather sealing on the K10/20D bodies this makes for a very practical all-weather combination. I’m sure this is a useful upgrade but I have shot in some pretty nasty conditions with my kit lens and have not had any problems with moisture penetration. (I have to wonder if most non-professional photographers would put their cameras through the kind of abuse this level of construction suggets is possible). The zoom and focus rings are well damped and buttery smooth with nicely ribbed rubber rings. There is no slop or wiggle between the various moving parts anywhere throughout the zoom range. 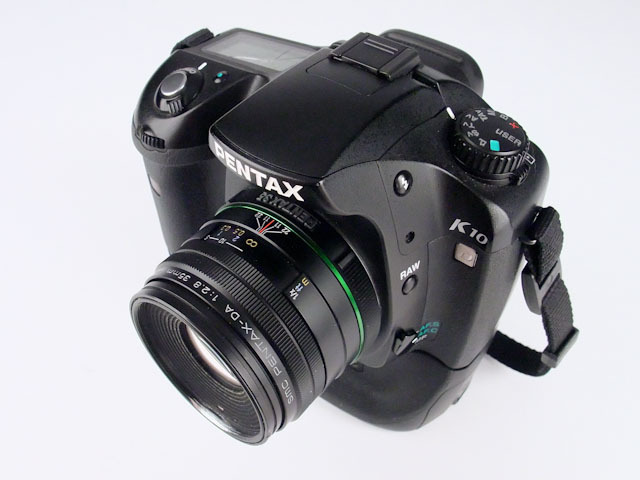 The access port on the lens hood is a nice touch common to all Pentax lenses. It allows access to the control ring on rotating filters without removing the lens hood (like polarized, graduated and special effects filters). This is a very user-friendly feature that all lens makers should adopt. After all, you usually find yourself needing to use these types of filters and the lens hood at the same time anyway, right? Another nice feature of this lens is the SDM ultrasonic focus system. This lens focuses absolutely silently. This can be a bit strange at first considering how loud the screw drive focus system is with standard lenses. It’s not noticeably faster or more accurate than the screw drive system (still hunts too much IMO) but its silent operation draws less attention to the fact that you are taking pictures (if only the extra-loud shutter wouldn’t betray us so). The focus ring can be used anytime to fine tune the focus. However, it is not directly coupled to the focus mechanism so it does not stop turning when you reach the either end of the focus range. Pentax has included an AF/MF selector switch on the lens for those times when you want full time manual control. This is a lot easier to use than the switch on the camera body and is a nice touch. 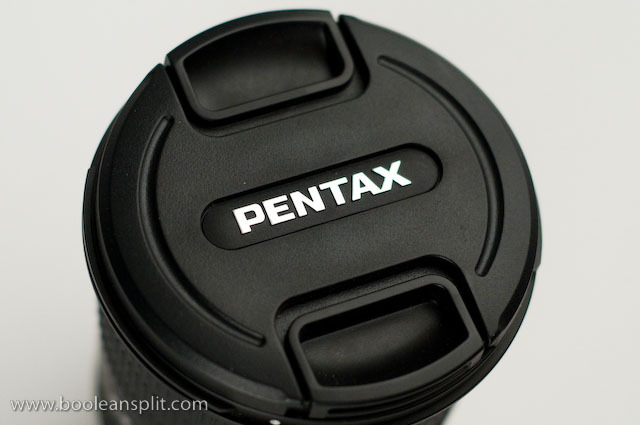 Why does Pentax make me spend $700 to get a decent center pinch lens cap? Now for the bad news. This lens is a brick. On my kitchen scale the 16-50 weighs 20oz while the 18-55 kit lens weighs in at 8oz and my old 50mm f/1.7 is only 5 3/4oz. (BTW, the K10D body w/ battery weighs 28oz). I realize that there is a weight penalty to step up to f/2.8 in a zoom but, considering this lens’ lackluster performance at f/2.8, I really have to question the benefit here. I mean, why carry around all this glass if you’re going to be shooting at f/4 anyway? Mounting this lens to the front of my K10D felt very awkward. The grip on the K10D is a bit shallow and hanging all that weight off the front of the camera made it very difficult to hold securely with one hand. I found myself carrying the camera by the lens and having to use two hands for most of my shots. (Adding a battery grip would help balance the camera and provide better leverage with the heel of your right hand). Don’t get me wrong. I don’t mind a heavy and expensive lens if the performance and application justifies it. (Canon’s EF 70-200mm f/2.8L IS USM is one of my all time favorites). Overall this did not prove to be a very good walking around combination. I find this interesting since this sort of everyday use seems to be the main focus of lenses in this zoom range. Another negative aspect the comparison photo in the section above illustrates is how long this lens is. The 16-50 is at its longest (5 3/8″ to the mount) at 50mm and its shortest (4″) at 16mm (as shown directly above with lens hood). 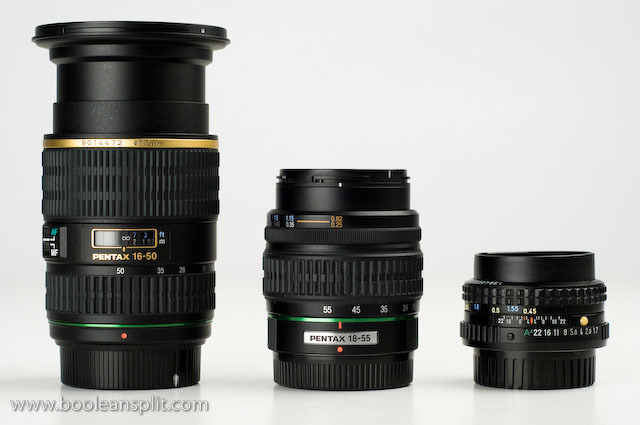 The kit lens is only 3 1/8″ at its longest which is at 55mm and 18mm. As you zoom from 18mm to 55mm the kit lens starts off long then retracts to its shortest length of 2 3/4″ at 35mm then back out to 3 1/8″ at 55mm. This double action means it only has to extend half as much (percentage wise) as the 16-50 does throughout its zoom range. I point this out mainly because 50mm on a 1.5X APS-C sensor is the equivalent of 75mm on a full frame sensor and 35mm film. This puts it right in the sweet spot for close portrait photography. However, when you point this thing at people they tend to back away as if you’ve just aimed a bazooka at them. I imagine it would be fine in studio situations but for candids and street photography the kit lens (or better yet, a 50mm prime) is clearly the better choice. The advertised advantages of this lens are its wide FoV (16mm), speed (f/2.8), SDM focus motor, build quality, 9 bladed aperture, weather sealing, and sharpness. However, in actual use I don’t find any of these things in combination to be a significant enough improvement over than the kit lens as to justify the price and bulk of the 16-50 f/2.8 DA*. 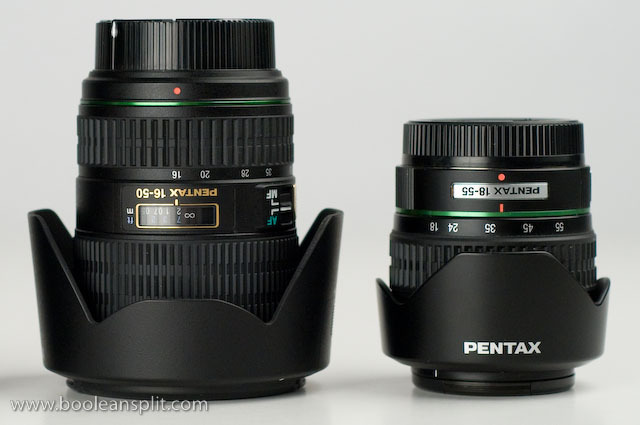 In fact, if this were the kit lens I would be looking to upgrade. If you have $700 burning a hole in your pocket there are a number of better choices out there. 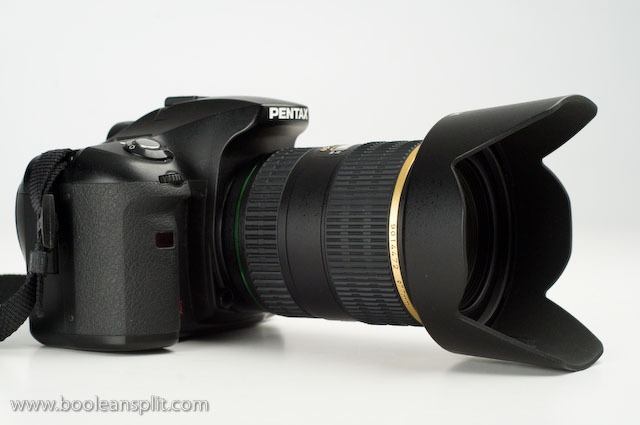 I suggest you look at the Pentax SMCP-DA 12-24mm f/4 ED AL (IF) ($670). It is a re-badge of the stellar Tokina 12-24mm f/4 AT-X 124AF Pro DX ($490) and makes a much more useful ultra-wide angle addition to the kit lens. (It is a bit frustrating that we Pentax users have to pay an extra $200 for the same lens the Canikon folks can get directly from Tokina). It is still pretty heavy (15oz) and will take up just as much room in your bag as the 16-50, but the ultra-wide angle shots you’ll get with this lens will absolutely blow you away. If speed and sharpness are what you are looking for pick up a fast prime or two like the Pentax SMCP-FA 50mm f/1.4 ($200) and/or the Pentax SMCP-DA 35mm f/2.8 Macro Limited ($480). If you really feel a burning need to try out a DA* lens, check out the new Pentax SMCP-DA* 200mm f/2.8 ED (IF) SDM ($890). Its bulk is easily justified by its extra reach and speed (just beware of some nasty purple fringing in high contrast scenes). 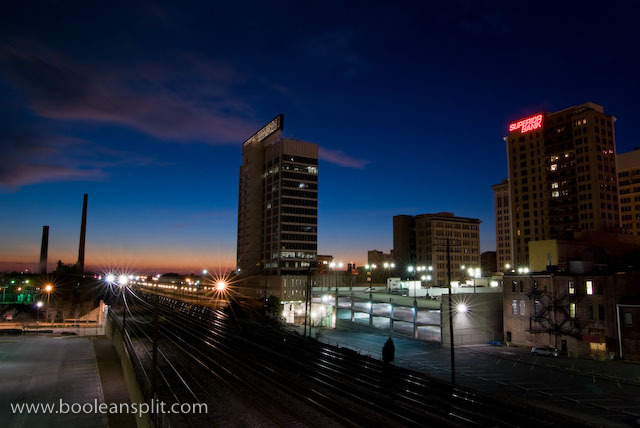 Some sample photos taken with this lens during testing. A number of readers have suggested that Pentax’s $380 SMCP-DA 16-45mm f/4.0 ED AL might be a better upgrade choice over the 16-50mm f/2.8 DA*. I have no experience with this lens so I did not mention it as an alternative. Reading over the photozone.de test report I can see that at only 12.9oz it is considerably lighter than the 16-50 DA*. Size wise it is slightly smaller than the 16-50 DA* with the added benefit of being at its shortest at 45mm (opposite of the 16-50). Also, it features an 8 bladed diaphragm which should result in decent bokeh and nice starbursts when stopped down. Resolution seems to be very good with distortion and vignetting similar to the 16-50 DA*. The only real noteworthy negative mentioned is heavy CAs at the edges of wide angle shots. If I can get my hands on one of these I will definitely post a similar review and find out if this lens is worthy of consideration. After writing this review it was brought to my attention that the 16-50mm f/2.8 DA* has suffered from some quality control issues. It is entirely possible that this example is flawed. However, in researching this a bit more I still find a number of reviews pointing to similar image quality problems on lenses that are supposedly in proper working order. Potential QC problems aside, my opinion remains unchanged about this lens. dpreview.com just posted their comprehensive review of Pentax’s latest entry-level DSLR, the K2000 (or K-m). Being a Pentax K10D owner I was excited to see the K2000 hit the market to go head to head with the entry-level Nikons and Canons. 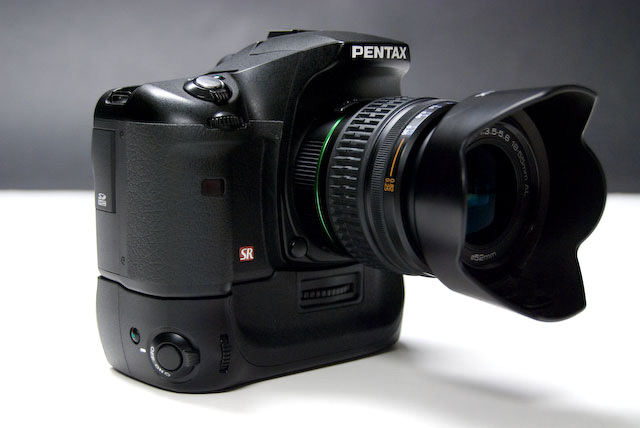 Unfortunately, it seems Pentax has taken a similar path as Canon did with their original Digital Rebel (EOS 300D). By simplifying the camera to appeal to novices, they have created a starter DSLR that most users will quickly outgrow. 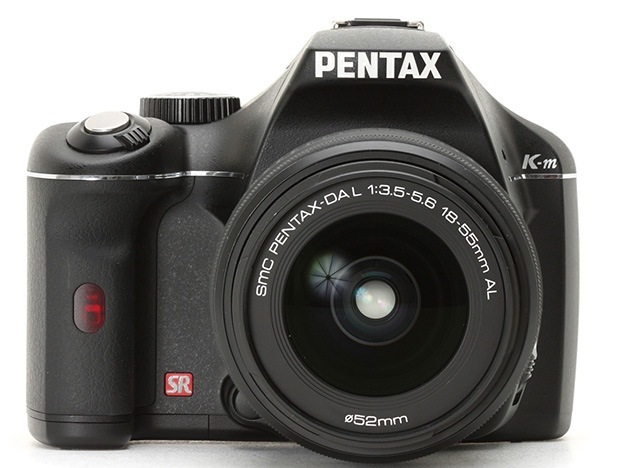 While I understand this tactic from a business perspective (when users outgrow the K2000 they will theoretically upgrade to a K200D or K20D), it frustrates me as a photographer that Pentax would hamstring the K2000 in the ways they have (read the review to see what I’m talking about). Seeing as how one can pick up a K200D kit for less than $500 these days, I’d have a lot of difficulty recomending the K2000 to anyone. But that’s just me. Be sure to click over to the dpreview.com review and decide for yourself.